We all have different priorities in life but, as a young man in the US Navy it always amazed me that many, if not most, of my peers did not have cars. From my early years in high school and as soon as I was finished with my basic training and my first ship had settled into port, it was important to me to get a set of wheels. My first foray into the affordable car market as a young sailor was a 1960 Corvair, which I soon traded for a 1959 Chevrolet Impala 2 door Sport Coupe. The Corvair was fun and the Impala was quite a score as trades go, and one of those cars I wish that I still had to this day but, that is not the subject of this story. The Impala had to be sold when my ship left port for a "WestPac" tour of duty, but upon return, I immediately found new wheels. I had saved quite a bit of money while overseas and decided I wanted something newer to drive so, in 1971 I bought a 1970 Fiat 850 Racer. It was just like an 850 Spider, a fairly small car, and it had a hardtop instead of a convertible top. I quickly realized that the Fiat was an oil leaker and that all of them were. I didn't get a bad car in particular. I got a bad car in general. I have always detested cars that leak and consider those that do of low character. If a car can't hold its oil, I don't have much use for it. This is an attitude that I developed after having a car in high school that required filling the oil and checking the gas daily. Having no use for the Fiat, I returned to the dealer that had told me what a wonderful car it was going to be. I felt I needed to let him know that I thought his judgment was lacking but, was willing to give him one more chance if he would take the Fiat off of my hands and put me into something of equal value to what I had paid for it. 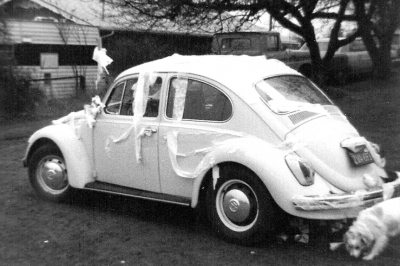 I was young and naïve and unaware of the mathematical juggling acts practiced under the three ring circuses of auto dealerships in the early 1970's but, I drove away in a 1969 Volkswagen Beetle... and that is the real subject of this story; my beloved Bug. Oh, the adventures, the road trips, the nights out and the economy. It cruised the highways and byways of southern California and up and down the entire West Coast many times. It was a discrete car for those indiscreet attacks on the evening and I could gas it up with my pocket change and run for days. There was actually money left to buy beer after I left the gas station! This was a car that was made for me. I could do mechanical surgery on it without hesitation and keep it in tune just like an old Chevy. I could actually time that car's engine by ear and feel the performance increase. I never did use a timing light on it. 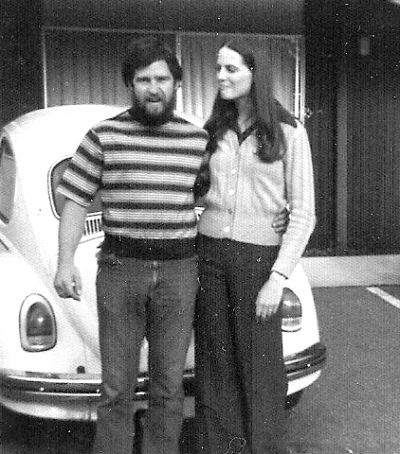 I had a close friend who had a 1970 Bug and we would work on our cars together. Having our act down pat, almost any issue was simple. As an example, we could pull an engine, change a clutch, reinstall the engine and be driving down the street in less than an hour. I know this to be true, because we timed the process once. There was a time when I thought I would have to part with the Bug. I had brought it up to Washington for about a year and a half, while my ship was in a yard period in Bremerton. This was a great time in my life because I was hanging with old friends and living near family. I also had a chance to see that the local job market was not good if I were to get out of the Navy and expect to go to work. As a result of that valuable insight, I reenlisted and was assigned to instructor duty in San Diego, CA. I planned to take my Austin Healy to California with me when I moved down there and the Bug was not going to fit into the plan. It was time to part with my beloved Beetle. I was pretty concerned with where it wound up and wanted to find a good home with an owner that would appreciate her the way I did. This was just like I might deal with a pet that couldn't move into an apartment. My, how we get attached to our cars! So, I put the word out and it wasn't long before a pretty young lady I knew stepped up to claim ownership. There was a hitch, however. If she was going to buy the car, I had to promise to teach her how to drive a stick shift transmission. To be honest, I thought that was a pretty fair proposition. She was easy on the eyes, intelligent when it came to conversation and well, she was going to pay me my asking price. I just had to teach her how to walk the dog, so to speak. Wanting to be sure my young trainee learned the proper way to drive my beloved Beetle, we spent many hours together cruizin'. We had a lot of fun and really enjoyed each other's company. I was going to miss the car and I was getting to the point where I thought I might miss our lessons, as well. At this point, I have to admit that the Bug was not without fault. By this time, it was over six years old and had a little sloppy shifter, as some of the older VWs did. I was always very careful when shifting it and had a deft feel for a precise shift. My pretty young student lacked the same skillful touch. One sunny afternoon as we were "practicing" driving skills, a shift to second gear resulted in a sudden grinding of metal as the car was unceremoniously jammed into reverse, resulting in an equally sudden halt of forward progress. My Bug had bit the proverbial dust. My pretty young driving apprentice's eyes went wide with shock, disbelief, and fear. Mine closed as my head bowed and fell into my hands. I couldn't cry. I couldn't yell. I took a deep breath and lifted my head to the world ahead of me. In a flash, I knew what I would do. I would get the car fixed and keep it. It was the strangest impulse. I wasn't sure why, but I knew I should just keep the car. To this day, I can't tell you where the notion came from but, I announced to my buyer that I was not going to sell the car and if she wanted to drive it she would just have to come down to San Diego. Did she want to move to San Diego with me? Well, guess what? She did. 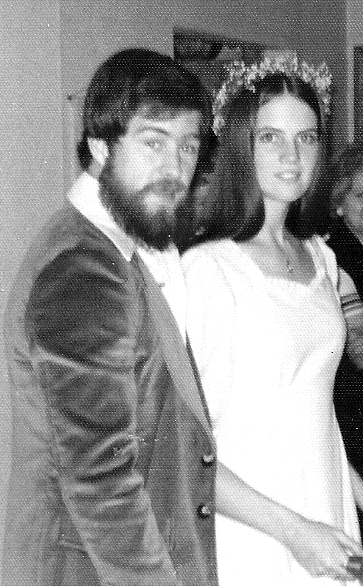 Her name was Denise and she became my wife. So, I kept the Bug and got the girl, too.